Baylor Women End No. 1 UConn's Years-Long Winning Streak In a 68-57 upset, the Baylor Lady Bears handed the UConn Huskies their first regular season loss since 2014. 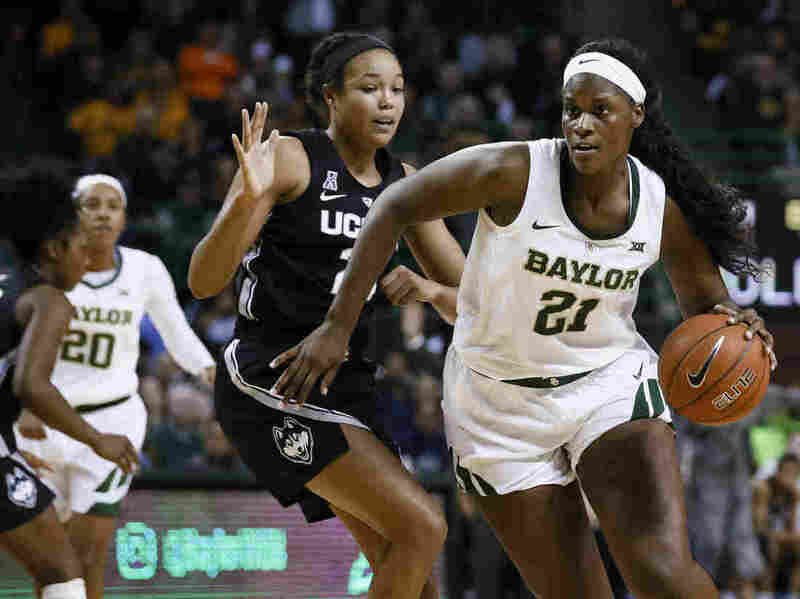 Baylor University center Kalani Brown (21) works around University of Connecticut forward Napheesa Collier during the second half of the NCAA game Thursday in which Baylor defeated UConn 68-57. The 11-time national championship-winning Huskies had not lost a regular season game during regulation or overtime since November 2014, ESPN reports. The team was defeated in each of the past two national semifinals. "What is disappointing for me, not that we lost. How long did you think you were going to win every game in the regular season, 10 years?," UConn head coach Geno Auriemma said, according to The Associated Press. "So I'm not surprised that we lost, but it was disappointing that we struggled so much on the offensive end." Before the game, The UConn Blog predicted that "guarding the Bears' star senior center Kalani Brown in the paint will be the toughest part of that test." It was an accurate assessment, as Brown scored 20 points and brought down 17 rebounds during the game. The only time the Huskies led was in the opening minutes of the game, when Crystal Dangerfield scored the first two points. For the Huskies (11-1), it was their final game before American Athletic Conference play begins Sunday in Houston. Baylor (10-1) opens Big 12 Conference play Sunday at Texas Tech, AP reports.